Tanks swap on frontal cone debuff, other raids don’t get hit by it. Spread heals and DPS around the room as equally as possible. Bloodlust/Heroism/Time Warp on the pull. Kill black adds, heal blue adds. Use OS heals on blue adds after third split phase. Most CC works on black adds, life grip works on blue adds, blue adds are slowed when they get healed. Use this order: Rook -> He -> Sun. Use Devotion Auras, Rallying Cries, etc. for Sun’s later Calamities. Get out of He’s poison void zones, Rook’s spinning crane kick and Throw Keg. Get away from other people if you are targeted by Sun’s Sha Sear. Never stand in front of Rook unless you’re the tank. Kite He around the room, stack up Sun and Rook in center. Tank turn away from Gouge. Healers dispel Shadow Word: Bane at three and two stacks, ignore at one stack. Kill order: Gloom -> Sorrow -> Misery. Make sure Gloom’s Corruption Shock is interrupted. Stack up on the kill target to deal with Inferno Strike. Kite Misery around the room. Pass the Mark of Anguish to the He tank and kill it ASAP. Stack up in the purple barrier in the center of the room. Melee AoE down the small adds in the bubble. Ranged attack the two large adds outside the bubble. Make sure they all hit 0% at the same time. Everyone stack behind the boss for heals, mark the location. Send down as many DPS as possible, as quickly as possible. Tank the large adds and DPS them down; ranged kill the small adds ASAP. Tanks soak the orbs that large adds spawn, call for a healer to help if necessary. Whenever a tank gets 100 Corruption they get top priority for next orb. Do not bother sending healers down. Do not get hit by the beam. DPS kill all four adds to pass your test and tanks survive for a minute to pass your test. Tanks taunt immediately after Wounded Pride. Assign people to unlocking prisons, make sure they are unlocked quickly. Players with Gift of the Titans need to make sure they are close to each other. Healers with the buff should try to get ~3 dispels (Mark of Arrogance) off during their buff duration. Spread out for Reflections, then AoE down immediately. If your group has enrage issues you can ignore the reflections, keep DPS on boss, and have the tanks passively cleave them down. Ranged turn and burn Manifestation of Pride, make sure it is interrupted/stunned. Make sure it is dead before Swelling Pride. You can remain stacked for swelling pride until peoples’ pride is above 25. Afterwards, spread for each swelling. Use personals/raid CDs here. If anyone gets 50-74 pride they need to get into their projection ASAP. It is a purple void zone that is marked with a large green arrow, they need to just stand in it until it disappears, then rejoin the group. If anyone gets 75-99 pride (very unlikely), they need to stay out of the group until their Aura of Pride debuff is gone (25 seconds). If the raid is at 100 pride, you have until the next swelling pride until you are mind controlled, the boss needs to either get pushed to 30% or 0% to reset the pride ASAP. In the final 30% the boss gives the raid ticking Pride and damage, use Heroism/Bloodlust/Time Warp and second potions during this time. Additionally, try to chain raid CDs for survivability. Everyone play their best DPS AoE spec. Tanks hold the adds in the Flame Strike/Blizzard put down by the friendly NPCs for additional DPS. Kill Banners/Totems ASAP, then stun lock/interrupt the Tidal Shamans as you kill them, then kill the Bonecrushers, then the rest. Grip the Flameslingers into the group for AoE. When the first mini boss spawns, Korgra the Snake, kill her two Ebon Stalkers first, then burn her down. Use defensive CDs when she hits 50%. Send a tank, 1-2 healers, and your melee DPS up to the first tower once you kill the first Demolisher; avoid the cones cast by the mini-boss at the top of the tower; someone needs to shoot down the proto-drakes with the canon ASAP once it unlocks. When the second mini boss spawns, High Enforcer Thranok, kill him ASAP. When he grips people in and starts to cast Skull Cracker, make sure everyone gets away. Send a tank, 1-2 healers, and half of your melee DPS up to the second tower once you kill the second Demolisher; avoid the cones cast by the mini-boss at the top of the tower; once the mini boss dies, have someone go up to the first tower. Once both towers’ canons are activated, have both of them hit Galakras at the same time right before another wave of adds are about to spawn (start trying to shoot her down at ~15 seconds until the next wave to be safe). This way, you give the ground team the most amount of time possible to clean up the adds. When the boss spawns tank her in the Flame Strike/Blizzard with her face up the hill. The raid should stack in melee behind her. When she targets someone with Flames of Galakrond, have that person run directly behind the stacked raid. A fireball will spawn and travel to the location they were standing at, dealing large damage when it arrives at the destination. The damage is reduced each time the fireball passes through a players, this is why the person runs it behind the raid. Use heroism/bloodlust/time warp when Galakras lands, be sure to clean up any remaining phase one adds FIRST, before attacking Galakras. The only purely single target encounter this tier, so choose DPS specs/classes accordingly. Face him away from the raid, and have the off-tank stand behind the boss when not tanking (the tank debuff is a frontal cone, not a targeted attack). Throughout the entire fight the boss will send out small non-target-able adds, Crawler Mines, that must be soaked before they finish their cast, or they explode on the raid. The tank that does not currently have the boss is the best person to do this, as soaking them (by right clicking them) does moderate damage. However, on normal mode, a player with any sort of defensive CD should be able to soak easily. All ranged/healers stay spread six yards. There are two phases he alternates between, Assault and Siege. The boss starts in the phase. In this phase everyone needs to be aware of void zones and other dangerous abilities on the ground. TL;DR: Move out of red circles, move away from spikes, etc. The boss transitions into this phase. Juggernaut is not tankable/movable/turnable during this phase, so make sure he is positioned well for melee right before he transitions. During this phase the boss will periodically cast Shock Pulse (three times total), which does massive damage and knocks everyone back a huge distance. Try to position yourself with your back against some kind of wall or structure to avoid this as much as possible. Finally, in Siege Phase there will be patches of black tar on the ground which does damage to anyone standing in them. Additionally, there will be a laser fixated on a random raid member that they must kite around. If they kite the laser through tar the entire raid will take moderate damage. Use DPS cooldowns during the Assault Phase and healer cooldowns during the Siege Phase. There are two strategies for this encounter, each of which favoring a different group composition. If you have high DPS and access to three tanks, the split strategy might be safer for your group. If you do not have good DPS and only two tanks, then you need to do the cleave strategy. Below we cover both strategies briefly. Kill the wolf mounts ASAP when the fight starts, then work on the bosses. Move Haromm (the melee boss) up the hill (towards Nazgrim trash) after the two wolves are dead, with two of your tanks, half of your healers, and your melee DPS. Keep Kardris (the caster boss) in the giant area where they spawn, with one tank, half of your healers, and your ranged DPS. Tanks on Haromm taunt off when the debuffs stacks are around 5-6. The Kardris team needs to look out for Toxic Storms, which are large whirling purple winds that spawn smaller purple tornadoes. Both of these do damage, just avoid them. Additionally, Kardris will periodically cast Foul Geyser which spawns small green globs on the tank. These do AoE damage to players around them, and burst when they die. Have your ranged DPS burn them down ASAP. Finally, Kardris will occasionally cast Falling Ash, which marks a large area of the ground with a red circle with a meteor coming down towards the center. When the meteor hits the ground any player in the red circle dies, and everyone else outside the circle takes moderate raid damage. The Haromm team needs to heal through the non-dispelable Toxic Mists debuff that is put on the raid. Also, Haromm will periodically cast Foul Stream on a random player (indicated by a bright green beam and arrow on the player) which after a short duration will create a massive void zone line from the boss’s position out in the direction of the marked player. Have that player move out of the raid. Finally, Haromm will occasionally cast Ashen Wall, on the tank, which spawns a large wall of immune elementals that will do massive damage to anyone in melee range. Keep Haromm and Kardris stacked on top of each other the entire fight. Move the bosses around the room in a circle, with the ranged and healers always trailing the path of the bosses, getting out of the bad stuff. All of the mechanics listed above in the Split Strategy still occur, but they now happen in pairs. Toxic Storm will go out at the same time as Toxic Mists. Foul Stream and Foul Geyser happen at the same time. Finally, Ashen Wall and Falling Ash are both cast simultaneously. DPS should be doing cleave/multidotting as much as possible in this strategy. Finally, this strategy may require more healers and raid awareness than the split strategy; however, the DPS requirement is less. Finally, the bosses will cast Bloodlust on themselves at 25%. To counter this, your team should also use Bloodlust/Heroism/Time Warp at this point to finish off the bosses as quickly as possible. The fight has three major phases: Battle, Beserker, and Defensive. Throughout the fight adds will spawn in waves. There are Assassins, Arcweavers, Ironblades, and Warshaman. Assassins should be stunned and face tanked by the fixated player. Arcweavers need to be interrupted/stunned for their entire duration. Ironblades should be tanked away from the ranged. Finally, interrupt and keep the Warshaman away from the boss. The kill order should generally be: Arcweaver > Warshaman > Assassin > Ironblade, but your raid might find a different order easier. Nazgrim will periodically cast a spell based on his current rage. He will always cast the most expensive spell he can afford. First is Shockwave, which creates crossing fire lines on the ground. Next there is a banner that needs to be killed ASAP. Next is the War Cry, which deals massive damage that should be mitigated with raid CDs. Finally, at 100 rage he can create a ravager which spins around the room for the remainder of the fight, stay away from it. Battle Stance: The fight begins in battle stance. In Battle stance the boss just generates 1 rage every second. Deal with adds and do damage to the boss during this phase. Berserker Stance: This stance always follows battle stance. In this stance the boss deals and takes 25% more damage and generates 100% more rage. All DPS should be focused on the boss during this phase, using CDs and potions to do as much damage to Nazgrim as possible. Defensive Stance: This is the final stance before he transitions back to Battle stance. In this stance the boss takes 25% less damage, reflects damage from the front, and generates 5 rage every time he is attacked. Focus on clearing adds from Beserker stance during this phase. Tanks can still attack the boss, and applying DoTs does not give him rage. At 10% Nazgrim starts to endlessly spawn large waves of adds. You should send a tank and your healers back to the adds to keep them locked down as all DPS focuses on the boss to finish him off before you are overwhelmed, regardless of what stance he is in. This encounter is the “Patchwerk” fight of the instance, with few mechanics. Malkorok always does a series of abilities, in the same sequence. They are: Seismic Slam (the knockup) -> Arching Smash (the cone) -> Imploding Energy (void zones to soak) -> Repeat Three Times -> Breath of Y’Shaarj -> Repeat Twice -> Blood Rage. Healers need to make sure everyone has a full shield all the time to soak the damage from Slam and Imploding Energy. Spread out for slam, knockup and damage splashes. Move out of the Arching Smash cones, have the raid leader mark the area of the cone for later reference. Make sure all of the Imploding Energy void zones have at least one person in them. After three Smashes and three sets of energy soaking, everyone needs to move away from the marked areas (places previously smashed). Anyone caught in those zones for his Breath of Y’Shaarj takes massive damage. After the second Breath of Y’Shaarj he enters Blood Rage phase. Everyone stack on top of the tank and use raid CDs to survive. If you get the Displaced Energy debuff, move out of the raid group until you are dispelled or it expires. Immediately rejoin the raid. After Blood Rage spread back around the room and treat the mechanics as if you just pulled the boss (the sequence repeats itself here). Split your raid team into two groups (1 tank, 1 healer, 3 DPS in 10m; 1 tank, 2-3 healers, 8-10 DPS in 25m). Try to keep the sides balanced in terms of classes and DPS output. Open the two pandaren crates the the beginning of the encounter for buffs. Follow up the pandaren crates with a large and some small crates. You want to utilize opening trinket procs, CDs, etc. for the large add. Additionally, you open some small crates that will die to natural cleave while killing the large add. You need a total of 50 energy to complete a room, mobs give the following energy when killed: 14-Large, 3-Medium, 1-Small. You want to kill 2 larges, and then whatever combination of mediums and smalls your raid is most comfortable with. Generally, we advise doing ~5 mediums and ~7 smalls. On Mogu Side prioritize killing Urns and Anima Golems over everything else. On Mantid Side prioritize killing Amber Encased Kunchongs and Wind Wielders. Matter Scramble: The Anima Golem add periodically casts this ability which will create a number of red pillars in the room. Your raid has to have at least one player in each of these pillars or you will take massive damage. Set to Blow: The Mantid Commanders will periodically put this debuff on a random player. The player receives an extra action button that will cause the player to throw bombs on the ground nearby. The player must throw all their bombs before the debuff expires or they will explode. Bombs should be dropped away from the raid. Torment: The Mogu Shadow Ritualist will periodically cast this debuff on members of the raid. This effect stacks every second increasing the damage the debuff does. When the debuff is dispeled its stacks reset and go to a new player. Dispel this once stacks start doing a lot of damage (6+). The debuff can only be completely removed by killing the Ritualist. Residue / Rage of the Empress: The Mantid Amber Priests and Wind Wielders each periodically cast their respective buffs on allies. These buffs need to be purged/dispeled off the enemies as soon as possible. This fight has two major phases: Stacked and Fixate. During the stacked phase your raid should be stacked on one of Thok’s sides, avoiding his frontal cone and tail swipe. Thok will periodically do a Deafening Screech doing large raid damage that interrupts casts. The frequency in which this is cast increases each subsequent screech. Once 5 (10m) or 15(25m) players within 10 yards of each other are under 50% health, at the same time, Thok will transition into his Fixate phase. During the Fixate phase Thok will randomly pick one of your raid DPS or Healers to fixate. He will walk towards them, instantly killing any players in his path. Additionally, he will accelerate his movement speed over time during this phase. Finally, a Kor’kron Jailer will spawn which must be killed ASAP. If you click on the Jailer’s corpse you will receive a key that allows you to open one of the three doors around the room. Opening the doors will give Thok a buff, but also end the fixate phase. You want to do this before Thok becomes too fast and he eats the raid. We recommend opening the doors in this order: Poison -> Frost -> Fire. Due to the nature of the Fire phase, we recommend leaving it as soon as possible (if Thok’s HP is sub 20%). Meaning, you should immediately stack and allow 5/15 members of your team to go below 50% HP and kill Thok during the fixate phase. Finally, off-spec cooldowns are extremely helpful in surviving Thok’s stacked phase. Note, cooldowns that make you immune to interrupts do work here, and should be used once his screeches are very frequent (Devotion Aura, Unending Resolve, etc). Blackfuse is a one phase encounter with a unique conveyor belt mechanic that needs to be properly executed to successfully finish this fight. Blackfuse has several abilities that he will cast throughout the fight, regardless of the belt. First, he will periodically cast Launch Sawblade on a random player. This shoots out a sawblade to that player’s location, knocking players back and doing high damage. Additionally, Blackfuse will apply a tank debuff that stacks and does large damage. However, this debuff gives a significant damage buff to the tank when they attack the Automated Shredder add. The Automated Shredder will periodically spawn near the conveyor belt and it must be tanked. The add takes only 20% damage from players who do not have the tank debuff. Due to this, tanks should swap when the Shredder spawns, allowing the tank with stacks to kill the Shredder quickly. The Shredder must be held more than 35 yards away to avoid Blackfuse healing it. Also, the Shredder will cast Death from Above shortly after being picked up, launching him into the air, then slamming down and knocking up and doing massive damage to anyone near the impact site. After the slam the Shredder will be stunned and take 200% more damage for 5 seconds. Finally, the Shredder will periodically do unavoidable raid damage via Overload. The final and most important mechanics of the fight are related to the conveyor belt. Every 45 seconds Blackfuse will send some unassembled weapons down the conveyor belt. If they reach the end of the belt and are not killed then they activate and do something to the raid. However, your raid can only kill one weapon each belt, so you need to choose wisely which ones to keep up and which one to kill. To kill the weapons on the belt you need to send up players by having them jump into one of the tubes near the belt. Players can only go every other belt, meaning you need two belt teams. For 10ms 1-2 players is sufficient per team, and 2-3 for 25m. Missile Turret: If this weapon activates, a large missile will land in a random part of the room and do pulsing rings of damage that must be avoided. Laser Turret: If this weapon activates, a random raid members will become targeted with a laser that they must kite around, causing fire to spawn where it is kited. Electromagnet: If this weapon activates, all saw blades will be removed from the room and players will be continuously pushed backwards and take minor damage. Crawler Mine: If this weapon activates, crawler mine adds will spawn and fixate on random players. If they are not killed by the time they reach their targets they do moderate damage to the raid. We recommend always killing the Crawler Mines to avoid the massive DPS loss associated with them. If there are not any Crawler Mines on the belt you should kill whatever weapon gives your raid the most trouble. Typically you will want to kill the Electromagnet. Finally, if all of the weapons on the belt make it through, Blackfuse will take 90% reduced damage for 20 seconds. Disclaimer: This fight will probably take more than 5 minutes of text to explain. Sorry we lied in the title, but we will still try to keep it brief! This fight includes nine Klaxxi Paragons, requiring you to kill all of them to finish the encounter. There are only ever three paragons fighting at a time, and the order in which they fight is always the same. The fight starts with Skeer, Rik’kal, and Hisek. You can choose which one of the three you kill first based on which mechanics your raid does best/worst. However, we recommend killing the paragons in this order: Rik’kal -> Skeer -> Hisek -> Korven -> Xaril -> Iyyokuk -> Kaz’tik -> Ka’roz -> Kil’ruk. Each paragon has its own set of unique abilities. Additionally, when they die their corpse becomes clickable, giving the player who clicks on them a unique ability. None of these abilities are vital to the success of the encounter, but they provide marginal DPS/HPS increases and situational uses. Rik’kal: Rik’kal will periodically cast Injection on his target which must be mitigated with the tank’s active mitigation to avoid spawning parasite adds around the room. Additionally, he will randomly transform raid members into scorpions which can do moderate damage to the boss with their unique abilities. Additionally, these scorpions can use their “Prey” ability to instantly kill a parasite. However, on normal, you should never get any parasites. When Rik’kal dies he drops a buff that allows the player to become a scorpion and do massive damage. It is safest to give this buff to a DPS and allow them to use it off CD. However, if your tanks and healers can manage it, a tank with high vengeance and this buff will do massive damage but also take moderate damage. Skeer: Skeer will periodically summon four blood slimes in the four corners of the room. These slimes move towards the paragon with the lowest HP. If they reach the paragon they give it a massive heal. These slimes can be stunned and slowed and should be killed before they reach the paragon. It is important to note that you should ignore these slimes if the lowest health paragon is sub 10%, as you can just kill it before the slimes reach it. Skeer’s buff should be picked up by a DPS player with high burst damage. Hisek: Hisek’s only mechanic you need to deal with is Aim. Hisek will randomly target a DPS or healer with aim, pushing them to the edge of the room and rooting them in place. After a few seconds anyone in between the targeted player and Hisek will take 3.5 million damage (evenly split). You will need players to jump in this aim to help the targeted player soak this damage. Priests, mages, rogues, and hunters can completely avoid the aim mechanic if they are targetted. Spectral guise (priest), greater invisibility (mage), vanish (rogue), and feign death (hunter) all cause the aim ability to just go away. Hisek’s buff should be given to a ranged DPS who is standing at max distance from the boss. Korven: Korven has two major mechanics. The first is his special attack on tanks. Periodically he will stun his target and do a frontal cone attack that does massive damage. No one should be in front of Korven except the tank, and the tank should use large CDs/externals before each Shield Bash. Next, Korven will encase the first paragon to reach 50% HP in amber, making them immune and eventually healing them to full. There are two ways to deal with this. If your raid has decent DPS, you can just burn Korven like normal, and then kill the Amber quickly when it spawns on him. If your DPS is lower you can “bait” the amber on a different paragon. To do think bring Korven to 55%, then any of the other paragons to 50%. He will amber the other one, then you have 25 seconds before his next amber to finish off his last 55%. His buff can be picked up by a tank and is moderately useful for mesmerizes later in the fight. Xaril: Xaril is easily the most annoying of the paragons. Using cooldowns, second potions, and/or heroism/bloodlust is recommended. When he spawns he will mark every player in the raid with either a yellow, red, or blue debuff. Later on he will randomly activate colors. If he activates red, all players with the red debuff to massive damage to anyone within 10 yards of them (SPREAD OUT). If he activates blue, all players with the blue debuff will take massive damage, evenly split with anyone within 10 yards (STACK UP). Finally, if he activates yellow, all players with the yellow debuff will spawn a small void zone below them that does light damage to anyone standing in it. Xaril’s buff is best used by a healer with burst AoE healing. Iyyokuk: Iyyokuk’s only mechanic is Fiery Edge. He will create lines of fire connecting random raid members, dealing massive raid damage to the targets (and anyone standing on a line). However, the damage is reduced by the distance between players. So, everyone targeted with a fire line should spread out to reduce damage. Use raid cooldowns and mitigations here. Iyyokuk’s buff is very minor and can be used by any healer. Kaz’tik: When Kaz’tik jumps into the arena small “Hungry Kunchongs” will spawn around the outside of the room. Randomly these kunchongs will fixate on a random raid member and force them to lose control of their character and walk towards the kunchong. If the player reaches the kunchong they will instantly die and the kunchong will mature, becoming a large tankable add. DPS can attack the kunchong when it fixates on someone to break the mesmerize. Additionally, if you ever walk near a kunchong, you will instantly die and mature it, regardless of if you are fixated or not. Finally, Kaz’tik does not do normal melee attacks, rather, he sends out projectiles in straight lines in random directions doing moderate damage. Ka’roz: Ka’roz has two major abilities. First is Flash and Whirling. Ka’roz will periodically start to dash around the room, at the location of random raid members. His path will leave a bright green line as an indicator of where he has been. One second after he has dashed through an area, and players still standing where he had dashed will take massive damage and be stunned for 5 seconds. Additionally, Ka’roz will periodically Hurl Amber down at the location of a random ranged raid member, creating a large orange void zone. Ka’roz’s buff can be picked up by any DPS role, but should be ignored as it is largely useless. Kil’ruk: Kil’ruk is the final paragon you will kill, and his abilities are easy to deal with. First, he will occasionally leap into the air, put down a small red circle below a random raid member, and a few seconds later come crashing down at that location doing massive damage. Finally, he will periodically cast Reave, which makes him spin in place doing high raid damage, while pulling the raid towards him. However, the damage taken from Reave is reduced the farther a player is away from the Reave. Kil’ruk’s buff can be picked up by a DPS; however, if you do the fight in this order you cannot use his buff since the fight will be over. Raid teams progressing on Paragons should try to avoid getting overwhelmed by the large number of bosses and mechanics in this encounter. Rather, you should just focus on the three bosses and mechanics you first need to deal with, then the next three, then the next three, etc. Work your way through the fight progressively and it ends up being not very complicated. Garrosh is a three phase encounter with three different potential transition phases. During this phase Garrosh only has one major ability, Desecrate. When he casts Desecrate, Garrosh will throw a weapon at the location of a random ranged raid member. This weapon will create a large void zone underneath it, which shrinks (and eventually disappears) as the weapon takes damage. Periodically two Iron Stars and Siege Engineers will activate on both ends of the room. If the Siege Engineer is allowed to live for the duration of its 10-second cast, it will shoot the Iron Star across the room. Anything that comes in contact with the Iron Star will take massive damage and be knocked back. You should send 1-2 DPS to one of the engineers so there is a safe spot for the raid to stand. When the Iron Star you didn’t kill hits the opposite wall, the raid will take moderate damage. Finally, adds will spawn from the sides of the room for the duration of phase one. They will be in sets of six Warbringers, and one Farseer. The Warbringers should be AoE’d down, and the Farseer needs to be interrupted and burned ASAP. When Garrosh reaches 10% phase one ends, he heals back to 100%, and you are thrown into one of the transition phases (see below). During this phase Garrosh does a sequence of three abilities: Desecrate -> Touch of Y’Shaarj -> Whirling Corruption. Desecrate works the same way as in phase one. Touch of Y’Shaarj will mind control random raid members and force them to cast more Touch of Y’Shaarj. They need to be interrupted and burned to 50% ASAP. Be careful about putting too many debuffs/DoTs on the raid members, because they will persist after the MC breaks. Whirling Corruption is the main raid damage of this encounter. Garrosh will spin around doing massive shadow damage to all raid members, with damage decreasing the farther you are away from him. These abilities can become empowered if you do not handle the transition phases quickly (see below). You will be periodically thrown into a transition phase during phase two. Pushing Garrosh to phase three before too many of these transitions occur is essential. At 25 energy, Garrosh will empower Whirling Corruption, making the ability also summon adds at the location of random raid members. On death these adds will heal other nearby adds to full and give them a 200% damage buff that stacks. Kill these adds away from each other. At 50 energy, Garrosh will empower Touch of Y’Shaarj, making the mind control targets immune to crowd control while they are mind controlled. Interrupts still work. At 75 energy, Garroshw ill empower Desecrate, making the weapons immune to death and regenerate HP over time. When Garrosh reaches 10% the phase two ends, he heals for 25% of his maximum HP, and you enter phase three. In the final phase, all of Garrosh’s abilities remain the same as phase two; however, they are all empowered. Due to this, you want to use Heroism/Bloodlust during this phase and end the encounter at quickly as possible. However, the number one way to wipe to this phase is to tunnel the boss too hard and ignore the empowered mind controls. Additionally, you should ignore any adds that spawn from the Whirling Corruption and focus the boss. Have one of the tanks kite/hold the adds away from the boss to eliminate the chance of passive cleaves killing them (and buffing the others). Following phase one, and periodically in phase two, Garrosh will throw the raid team into a transition phase. During this phase Garrosh will be immune and gain one energy per second, until you “unlock” him by killing all the adds in this phase. There are three different possible phases each transition: Terrace of the Endless Spring, Temple of the Jade Serpent, or Temple of the Red Crane. Each has a different lay out, different sized adds, and a different quantity of adds. In Terrace of the Endless Spring there are a lot of small health adds. Additionally, Garrosh will randomly throw down void zones on the ground that should be avoided. The best strategy for this transition is to speed boost up to the top (where Garrosh is) so you can just AoE burn all the small adds down at once. In Temple of the Jade Serpent there are five packs of three medium health adds. These adds will cast an interruptible nuke that also increases the damage of future nukes by 25% (this stacks). On normal mode, this damage is negligible, but any interrupts will certainly help. The best strategy for this transition is to kill the first three groups near the spawn, then speed boost to the back two groups. In Temple of the Red Crane there are two large health adds. These adds must be tanked and killed as soon as possible. The best strategy for this transition is to split your raid team into two equal squads to handle each large add. As soon as all of the adds die in a transition phase, Garrosh will stop gaining energy and become attackable. For the duration of the transition phase he will not be tankable and will cast a frontal cone in a random direction back-to-back. If you are hit by this cone you will die. Even if no one is hit by the cone, the entire raid takes high damage each time it is cast. The Garrosh encounter is largely a DPS race style fight that requires attention to the very few mechanics present in the fight. Making sure you do transitions quickly and efficiently, and making sure you keep Garrosh below 50 energy before phase three is extremely helpful. 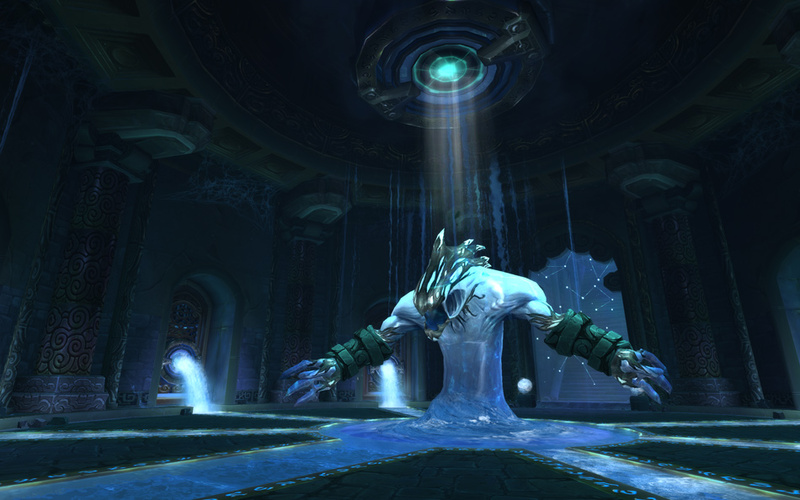 Thanks for reading our “brief” normal mode guides for the Siege of Orgrimmar instance. We know we went a little bit over our promise of 5-minutes for some of the fights. However, we tried to balance the need for brevity and making sure we included everything you needed to know for the fight. Since this is our first time doing something like this, we would love some feedback! Tell us what you thought in the comment section below or tweet us @Healcraft. We hope this helped your raid team, and happy healing!